Jumia Supermarket, Have all your need by one click! Jumia is always keen on facilitate people lives. Hence, Jumia Egypt team decides to open an online supermarket. In Jumia supermarket, you can find all your home needs as well as your personal wants. In our supermarket, we have 4 sections; laundry & Household, Baby products, Hair & Body Care, Food & Beverages. You can now make your shopping from home without suffering in streets traffic. We have a lot of top brands in all sections such as Pampers, molfix, Johnson, Spinneys, Regina, Hero baby, Riri, Eva, and many more. 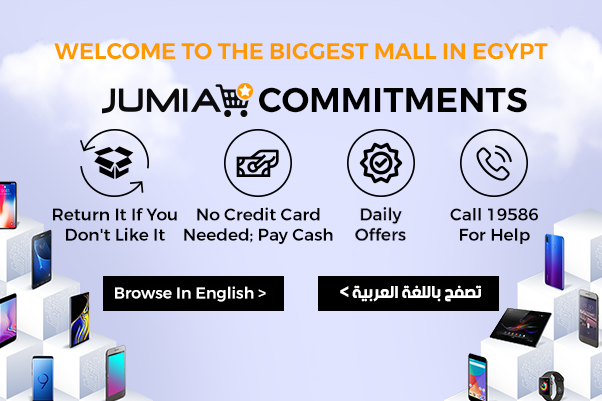 Moreover, Jumia Egypt delivers all your orders at your door step! Supermarket Shopping has never been easy like now! On Jumia, you will find all your home necessities. In our supermarket, you have cleaning tools and accessories, powder and gel detergents, household cleaners, Air fresheners and paper tissues and wipes. So you can have all what you need in your kitchen, such as clothes detergent, dish washing detergents from different brands such as Harpic, Detol, Finish, Vanish, you can also find different brushes and mops for cleansing purposes. As for the food and beverages, we have pasta, jam, rice and all that may come to your mind. We have also different brands to suit your budget such as Regina, Masreya, Star, Hero, Vitrac and many more. You can even shop for all necessities and essentials for the holy month of Ramadan, including products such as Ramadan box and Ramadan lanterns! We have not forgot your personal care, neither your baby’s one. In Jumia Supermarket or market category, you can find a special section for your baby food, and necessities such as diapers, food, shampoo, baby oil, cream and all his essentials. We try to make your baby happy. As for you, you can find as well all products for your personal care, hair, skin and all other stuff. You can find hand wash, face wash, creams, conditioner, mouthwash, shower gel, deodorant, pads, and many more. In this section, you can also find different brands with different prices such as Always, Sherosa, Eva, One, and many more. All in Jumia Supermarket!